I don’t know how old I was when I found out that Memorial Day honored those who gave their lives while serving in our military, but I distinctly remember thinking how odd it was watching folks in the neighborhood celebrate by cooking out or going to the beach. But, as you enjoy relaxing today, please take at least a minute or two to remember the reason for the holiday. Growing up in a Navy family in a military-heavy city, I’ve seen folks work hard at often-thankless jobs despite playing a vital role in our national defense. They deserve our respect, particularly the ladies and gentlemen who made the ultimate sacrifice for this country. Judging by some of the search queries bringing folks here to law:/dev/null, those of you accepted into the Class of 2013 are scurrying around online looking for law school advice before orientation starts in a couple months. First, CONGRATULATIONS! I was just in your shoes not too long ago, I remember what it was like, and I’m excited for you! Third, assuming you’re going to ignore that previous paragraph, use the summer to learn how to manage your finances. I’ve met a lot of law students from a lot of law schools who barely know how to balance their checkbooks.1 Law school is stressful enough without being worried about money. This one probably seems like common sense, but it’s probably the most important thing you can do financially — make sure you’ve got a decent idea of how much money you’ve got coming in, and how much you’ll have going out. No matter what level of complexity you use, the important thing is to try and stick to the budget whenever possible. To the right is a sample budget I put together for this blog entry, which I’ll probably end up using for the upcoming year. 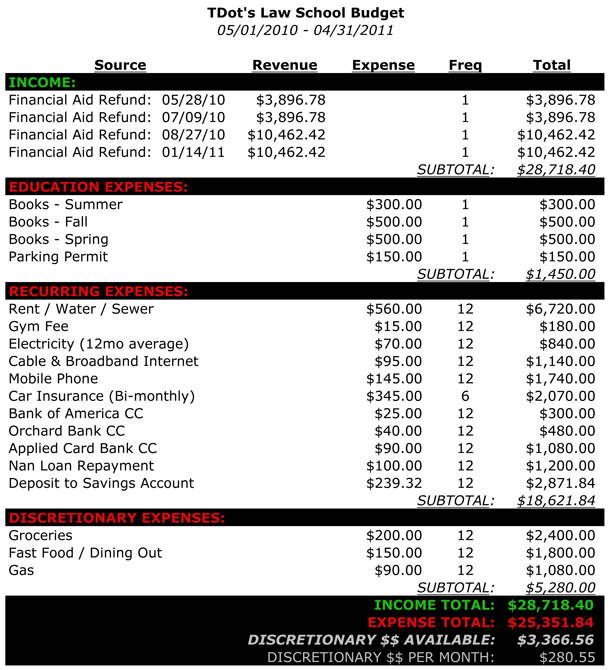 The main thing is to have an easy-to-reference sheet where you can see your major expenses and income sources. You might notice in that sample budget that I’ve included “Deposit to Savings Account” as an expense. One of the weird things about 1L life is that you’re strongly strongly strongly discouraged from having any outside employment at all.2 That means if something unexpected happens, you don’t have the option of working overtime or extra shifts to make the $$ for it. So if you’re living off student loans like most of us, your financial aid refund is all you get for the entire semester. Set aside a chunk of it early (I’d suggest 10%) into a savings account or some other safe spot, before you get tempted to spend it. 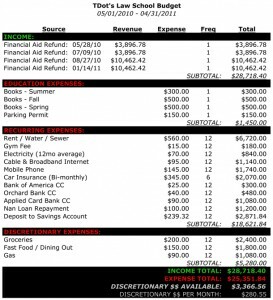 Most of the expenses you’ll have in a given month will be in the sub-$100 range, and a good chunk of them (e.g. cable TV, fast food, etc) can be given up if you get into a real financial bind mid-semester. As you’re searching around your new city for an apartment, make sure to do a comprehensive comparison among your options — then pick the least expensive place you’re still comfortable living in. I’ve got a classmate who I’ll leave nameless, but who definitely isn’t stupid. When he signed his lease back in August, he picked a newer apartment complex up the road from me with all kinds of fancy amenities — gated entrance, nice pool, nicer gym, detached garage, etc etc. A really swank place, about $75/mo more than mine. Then when late November got here, he was running short on his funding and was stressed out trying to figure out how to cover his December bills… right as he had to start studying for final exams Luckily for him everything worked itself out, but you don’t need that pointless stress. For that $375 he paid more than me over the 5 months of Fall semester, he used the nice pool all of 0 times, went to the nice gym just the first month before studying took up his free time, and spent a good chunk of his life at the law school while his detached garage was empty. Plus his summer internship is in another town so he’s trying to find someone willing to sublease for just a couple months (thus far no takers). Now if a potential apartment just screams to you “LIVE HERE!“, then by all means go with it. Preferably after getting psychiatric help for thinking your apartment is screaming to you But if you can handle a smaller pool or gym, or forgo the entrance gate, consider giving up those amenities for the $$ you’ll save over the course of the year. By the time folks reach law school, odds are good they have at least one credit card. An April 2009 study found graduating students on average have 4.6 cards carrying $4,100 in debt. Despite the high interest rates many credit cards charge, they can provide an invaluable level of financial flexibility. I’ve had to use mine on more than one occasion for textbooks or tuition when financial aid didn’t stretch far enough. If you get a financial aid refund, throw it all at your highest interest rate credit card(s). You’ll end up using your cards throughout the semester for basic purchases and paying bills, but you’ll be paying less in daily interest than if you kept the $$ in your checking account while making minimum payments on the credit card(s). That’s all I’ve got for this post — hopefully you’ll find at least one of these tips useful! Good luck to all of you, and congratulations again on your acceptance! If you have any questions on anything, let me know! Before an officially 3-day weekend. Thank you for indulging my whining folks, I’ll have something more substantive during my extended weekend aka mini-vacation Have a great night! This is the first time I’ve taken night classes at the NCCU School of Law, and it’s also the first time I’ve had regular classes on the weekend. Both of them require some mental adjustment — reminding myself to get work done during the day Tuesday-Thursday that I’d normally save for the weekend — but being able to squeeze all this into just 5 weeks is worth it. The Superior Court Mediation class isn’t pictured because it’s already done That was a 5-day, 40-hour beast that seemed ridiculously long at the time but taught me quite a bit of info. The ADR Clinic tied in with the Mediation class will continue all summer long, where I’ll be in court on Mondays helping to mediate cases in District Criminal Court and on Fridays get to observe other ADR programs like Wake County’s Drug Treatment Court. Then the last class I’m taking is Race and the Law, which essentially looks at how American jurisprudence has developed vis-à-vis the various ethnic groups in the country (e.g. things like property law and American Indians, or the entire legal apparatus developed to sustain slavery and later segregation). The professor has a reputation as an excellent instructor that extends well beyond NCCU Law, and the topic itself is fascinating — especially compared to the watered-down history we learn in K-12, coupled with folks’ general aversion to talking about race at all. That’s it for tonight — hope all of you have a great evening! Earlier today I saw this story in the Washington Post about the Court’s opinion yesterday in Lewis v. Chicago, shared on several friends’ Facebook profiles with various commentary relating to then-Judge Sotomayor’s opinion (along with the rest of the 2nd Circuit Court of Appeals) in Ricci v. DeStefano. The headline: “Justices say employers may not use discriminatory testing practices”. From my reading of it, the City of Chicago’s test for prospective firefighters was found to have a disparate negative impact on minority applicants. The City conceded the point on appeal. The case at the time it reached the Supreme Court seems to be just a basic civil procedure issue: for statute of limitations purposes, did the minority firefighters’ cause of action accrue (i) when the testing policy was announced, (ii) until the policy was repealed (e.g. as though it were a single-but-ongoing discriminatory act), or (iii) each time the discriminatory results were used? To the 3Ls and attorneys out there, am I missing something? If I’m right in my understanding of the case, it’s less of a surprise (to me at least) that the Court issued a unanimous ruling. Deciding a separate cause of action accrued with each use of the results makes sense and doesn’t even seem all that controversial. Any insight from folks with more legal training is appreciated, just so I know for sure whether or not I’m clueless here1 Until then, have a great night y’all! The dispute was between two middle-aged women who had gotten into an altercation at work, and when the regular mediator and I first started talking to the parties it seemed like the case wasn’t the type that we could resolve through mediation. The complainant said she was determined to have the criminal charges against the defendant heard in court and wouldn’t dismiss the case (which of course happens when a negotiated settlement takes place). The sudden and unexpected pressure of having to perform for srs was intense. I really wanted to and apparently my face went pale for a couple minutes before I snapped out of it. But about 2ish loooooong hours later, we had an agreement in the case that both parties liked so it was officially a success! Not sure I could replicate that with many other cases but it’s good to start on a high note. We’ll see what the rest of the Clinic work holds this summer. Heading to bed so I can sleep in tomorrow morning Have a great night y’all! That’s how long it will take for the waiting to end. Professor CrimLaw was one of the mediation observers at Day 4 of mediation training today, and I figured I’d exploit the opportunity to figure out when I’ll officially know if I’m a 2L. 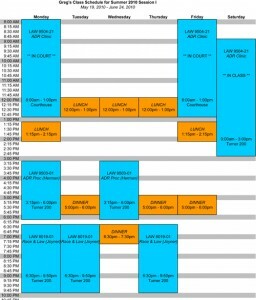 That’s what I had for this whole mediating thing, great expectations. Today was Day 3 of Superior Court Mediation training, and my first in the “hot seat” mediating a mock dispute. The plaintiff was a contractor who built a brick patio and gazebo for a client, who then refused to pay. The contractor had selected the wrong color brick at the outset… but the client approved it. Then when the project was done, the client complained about the color and insisted it be fixed. The contractor agreed to replace the facade for an additional $8K or so, to which the client agreed, and then the client refused to pay when the second set of work was actually done. Both sides were adamant in not wanting to budge much to narrow what was essentially a $12K gap between their respective demands. The clients in particular were the combative / argumentative types who didn’t like the idea of thinking about things from the other’s shoes or listening to the advice of their respective attorneys. The whole experience was odd because it was one of the most difficult things I’ve ever done, even though my background in lobbying and politics was going to make it comparably easier (so I thought) because of the experience forging compromise among people with different personalities and moods. Naïveté FTL. Maybe it’s just because this wasn’t a “real life” case, but damn that was rough. We’ll see what happens tomorrow. Have a great night y’all! I suspect most of us would agree with the proposition that law school centers around a quasi-caste system. The 3Ls, only a few classes and a Bar exam away from becoming The Anointed, are at the top. They know the professors, they’ve taken the classes, they run the student organizations. 2Ls seek them out for advice and mentorship; 1Ls hang on their every word. Then in the middle are the 2Ls. They hold leadership positions throughout the school, but usually in lower roles like Vice Presidents or Secretaries or Treasurers. They still have questions for their 3L mentors, but now they provide answers to their 1L mentees — unless a 3L is around for the 1L to get a second opinion. They’re basically sowing the ground preparing for the next year’s harvest. Tonight was my first elective class at NCCU Law, titled “Race and the Law”. I’ll get into the course details and why I’m taking it in another entry, but the thing that struck me was the balanced mix of freshly-minted 2Ls and 3Ls in the course. The balanced demographics also yielded balanced participation, with the attendant (but balanced!) cluelessness and even sparring between opposing viewpoints. It’s like those [#]L divisions just melted away for a few hours and we were all the same lump of proto-attorneys analyzing American jurisprudence. Not sure if this is a common occurrence in other electives or other law schools, but I thought it was pretty cool… and a reminder that we’re all getting professional training in a professional institution to become fellow professionals, not mere schooling in a university to become college graduates. Oh and Lobbying for Lawyers is 40% done! Heading to bed now so I can get up early for Day 3 — good night y’all! None of those results really surprise me I guess, but it seems to be a common occurrence for folks’ results to change frequently — and how useful is a personality survey like this if the results fluctuate regularly? Do our personalities really change that much over time? Enjoy! Have a great night y’all! !